Platform independence and proven support for both Asynch and IBM applications. 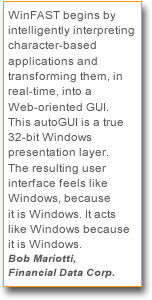 A complete and readily deployable GUI version of your applications using WinFAST's autoGUI. Application extensions can be incrementally added over time for new application features and customizations. Integrate directly (OEM) into your product offering. become achievable when automating the process. Automating the rejuvenation process is what our technology is about. Being fast and affordable has the advantage over the alternatives. The level of automation we bring to the rejuvenation process eliminates the front-end effort involved in manually customizing the textual green screens to achieve even the basic GUI. In conjunction with the WinFAST autoGUI component, the functionality of the Windows interface can also be used to extend the functionality of the legacy application. With the Windows desktop at hand, important extensions like HTML menus, pop-up menus, drop-down lists (combo-boxes), function buttons and a host of other standard Windows components can now play a prominent part in your screens.WinFAST further extends applications by providing integration of embedded HTML regions that support image, sound, e-mail and Web links - all of which help meet the increasing demand to deliver applications over the Web. As a result, WinFAST is both the logical and tactical choice for established businesses on the fast track looking to meet the demands for Windows functionality and a versatile Web-oriented GUI.